Please describe how you would approach the creation of a software solution that would compare a random text document that talks about any number of topics against a standard document that defines the standard content of 20-50 topics. As an example, you would have a standard security policy document defining several security topics in chapters of text (physical security, logical security, password policy, two factor authentication, etc) and you would (automatically) compare the content of a random policy document against that. 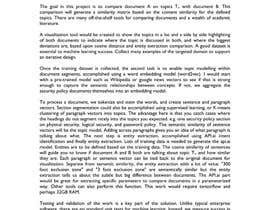 The comparison would show on a content level, where and to which extent the random document differs from the standard. Please describe the approach, the open source software tools/algorithms you would involve, the machinen learning techniques you would use as well as an assumption on the effort of development, testing of such solution. Based on the best proposal, we might be looking into a longer term working relationship. p.s. : Obviously we are not looking for a docdiff or other comparison tool, but for a ML solution that would perform a comparison to a standard on a content level.